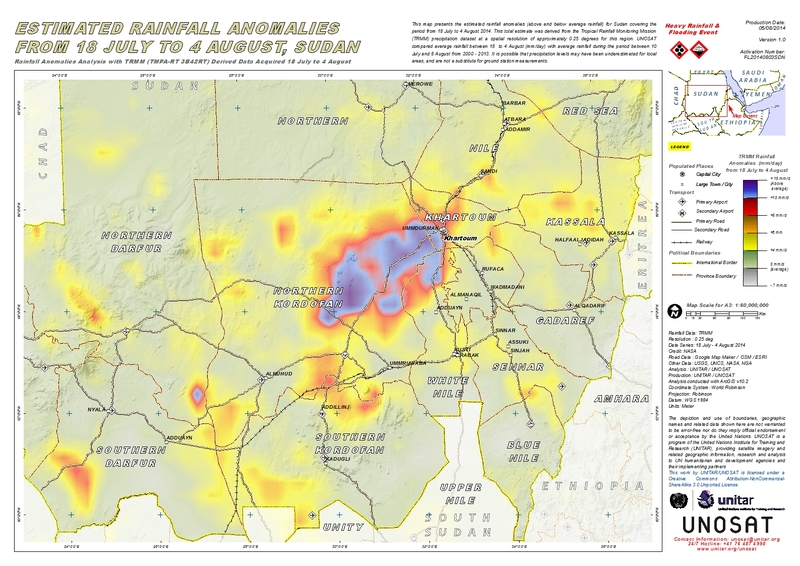 This map presents the estimated rainfall anomalies (above and below average rainfall) for Sudan covering the period from 18 July to 4 August 2014. This total estimate was derived from the Tropical Rainfall Monitoring Mission (TRMM) precipitation dataset at a spatial resolution of approximately 0.25 degrees for this region. UNOSAT compared average rainfall between 18 to 4 August (mm/day) with average rainfall during the period between 10 July and 8 August from 2000 - 2013. It is possible that precipitation levels may have been underestimated for local areas, and are not a substitute for ground station measurements.